SOUTH BEND, Ind. (AP) — The rectangular medal with the Notre Dame leprechaun etched on it along with the inscription “Effort Toughness Leadership Commitment” is on a chain around the neck of 65-year-old Keith Penrod, a gift from linebacker Drue Tranquill. Penrod, familiar to many fans for his lifelong devotion to Notre Dame athletics, has battled cerebral palsy since birth but has also recently been rehabbing a broken ankle that has kept him away the team and players he loves. “Tell Drue I love him,” Penrod said recently with a laugh on his angled face, with his crooked fingers caressing the gift he received from Tranquill, who received it from Matt Balis, the team’s director of football performance, for his work prior to the 2017 season. The gift and friendship between the 23-year-old team captain and the elderly fan doesn’t surprise Tranquill’s teammates or his coach, Brian Kelly. Tranquill’s emergence as a team leader in his final season at Notre Dame has been compelling to watch. He’s had to work hard, too. “I think what people don’t recognize is his growth as a teammate from last year to this year has been amazing,” Kelly said. “It’s hard to imagine being Drue Tranquill — an engineering student, a great player, a great citizen (who is) great in the community (and) spiritually. He was almost too hard to imagine and almost too hard to mirror. “Drue has instilled his toughness in all of us,” junior cornerback Julian Love said. “On a high day or a low day, you’re going to get the same guy,” fellow linebacker Te’von Coney said. It has been quite a year for the third-ranked Irish (11-0, No. 3 CFP) and Tranquill, who married his Fort Wayne Carroll High School sweetheart, Jackie Gindt, in July. A few weeks later, Tranquill and fellow captains Mustipher, Alex Bars and Tyler Newsome led the Irish through five hot days of preseason workouts at Culver Academy and now 11 straight victories to set the table for a possible spot in the playoff. A single regular-season game remains, against longtime rival Southern California on Saturday at the Coliseum. Last week at Yankee Stadium against then-No. 12 Syracuse, Tranquill had perhaps his best game of the season with seven tackles, including two sacks, despite leaving the game twice with an injured ankle. It’s been a familiar if unwelcome theme for Tranquill. After arriving on campus as a freshman safety, in 2014, he tore the ACL in his left knee against Louisville and the following year against Georgia Tech he tore the ACL in his right knee. Following a 4-8 season in 2016, Kelly restructured his staff and new defensive coordinator Mike Elko moved Tranquill to the rover spot in Notre Dame’s 4-2-5 defense. 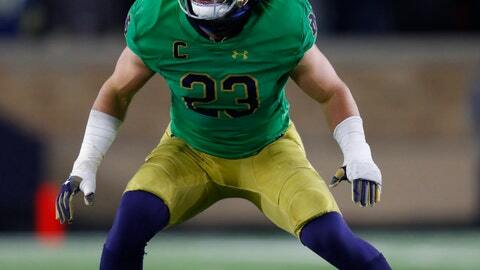 Tranquill responded with 85 tackles (44 solos) and three fumble recoveries for the 10-3 Irish and then decided to return for a fifth season that’s had more bumps and bruises. Despite suffering a broken hand on the first series against Stanford on Sept. 29 and then having his ankle rolled in Notre Dame’s win over Navy on Oct. 27, the 6-foot-2, 235-pound Tranquill is tied with free safety Alohi Gilman with 66 tackles, 52 of them unassisted, trailing only Coney for the team lead. A May 2018 graduate with a 3.73 grade-point average in mechanical engineering, Tranquill is one of 13 finalists for the National Football Foundation’s William V. Campbell Trophy and $25,000 postgraduate scholarship. He’s also a finalist for the Wuerffel Trophy presented to the player who combines community service with athletic and academic achievement. Tranquill, who has made mission trips to the Dominican Republic, works with Dream Teams, a mentoring program with South Bend’s elementary schools. Penrod, who once rode a Greyhound bus to Pittsburgh to help inspire Gerry Faust’s Irish to their 31-16 upset of quarterback Dan Marino’s No. 1 Panthers in 1982, lives a short cart ride from the Notre Dame practice fields. He has been unable to visit the last eight weeks after a hit-and-run driver broke his ankle, sending Penrod to a hospital and now a nearby rehabilitation facility. Tranquill has visited Penrod and the two stay in touch via text message. One of the first texts Tranquill received following his injury against Navy, while still in San Diego, was from Penrod. The latest came after Saturday’s 36-3 win over Syracuse. “Praying Christ continues healing your body,” Penrod texted. One more win and the two will have even more to talk about.